Richard Mayhew is one of my favorite artists because (hello!) he specializes in landscapes. He’s also been in the forefront of the effort to promote African American art without it having to express themes about African American life. Mayhew was born on Long Island, New York to parents were both of mixed Native-American and African-American heritage. As a child his maternal grandmother taught him about the Shinnecock (people) reverence for nature. 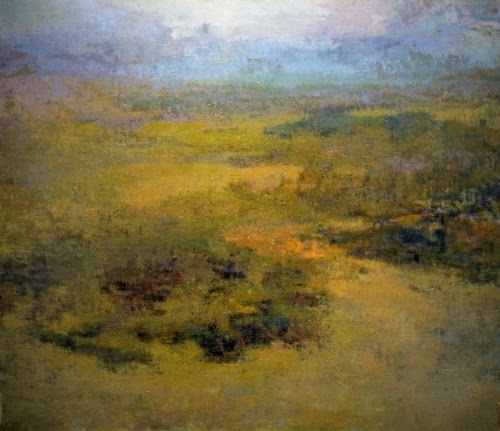 Mayhew attributes this as one of the key factors in his interest to paint landscapes. As a teenager he was also influenced by the landscapes of George Inness (1822–1898) and of the French impressionists and Barbizon school. He was impressed by their manipulation of pure color and light. Mayhew, as one of the founding artists of the group Spiral in 1963, advocated that the artist's individual style was as valid of a statement to the African-American community as are allusions to African art or scenes of African-American life. He felt that if an artist's painting evoked some meaning to an African-American, then it was a valid statement of African-American art, even if it was abstract. The painting North provoked a jazz musician who viewed it to liken Mayhew's colors to the blues, a musical style developed by blacks. North comes from a brief period in the late 1960s and early 1970s when Mayhew's work bordered on pure abstraction. It is also representative of his focus on how light and layering of color could create space. His landscapes are not painted from sketches or direct observation, but rather from memory. The bright pure colors heighten the romantic aspect of his landscapes and elevate them to symbols of reverence for nature. Studio activity: Paint a hazy landscape. Using watercolors, gouache, or tempera, paint an imagined landscape in the style of Richard Mayhew. Pay attention to warm and cool colors, noticing that Mayhew—like many artists—uses warmer colors in the foreground (in this painting a yellow-green) with cool colors in the background. Warm colors tend to come forward visually, while cool colors tend to recede.